For the fifteenth year in a row, New Belgium and Belgium’s Oud Beersel have collaborated on Transatlantique Kriek. The beer, this year released in 375-mL, cork-and-caged bottles, is a 50/50 blend of New Belgium’s foeder-aged, sour golden ale and Oud Beersel’s cherry lambic (kriek). From the crimson pour to the nose and palate, cherry dominates. There’s tart cherry and acidity on the nose, and more of the same in the first sip. Move past that initial tartness, though, and you will find more of a syrupy sweetness from the fruit — almost like cherries cooked in a pie. The fruit tempers the pleasant, just-right acidity, and paves the way for a refreshing finish. Digital Bath is the fourth collaboration between Belching Beaver and the Deftones, and the first in the New England style. For this IPA, Belching Beaver used Citra, Galaxy, Mosaic, Nelson and Simcoe Cryo hops to create “something loaded with citrus notes for summer.” The brewery and band have achieved that, with big grapefruit notes and bitter orange. Far from one-note, however, the beer also offers up green onion and an herbal note that almost comes across as thyme. Digital Bath is complex and juicy, with a dry finish that compels another sip. An attempt at disproving the myth that international bitterness units (IBU) can only be achieved in the boil, Dogfish Head’s Liquid Truth Serum employs a variety of post-boil additions of hops in pellet, powder, leaf and liquid form. On the nose, all of those additions create a sweet orange profile. On the palate there’s more orange as well as grapefruit, but with a surprising amount of lemon and a leafy, fresh-hop character. And, as Dogfish Head hypothesized, there is indeed a decent amount of bitterness courtesy all of those post-boil additions. Lagunitas Brewing Co. calls its newest beer a “citra-hopped mega ale of intergalactic proportions,” but we’ll call it a double IPA. There are big, juicy notes of grapefruit, pineapple and tangerines, as well as a little bit of an herbal, peppery quality from the hops. As the beer warms, notes of sweet orange and bready malt peek through past the dankness. 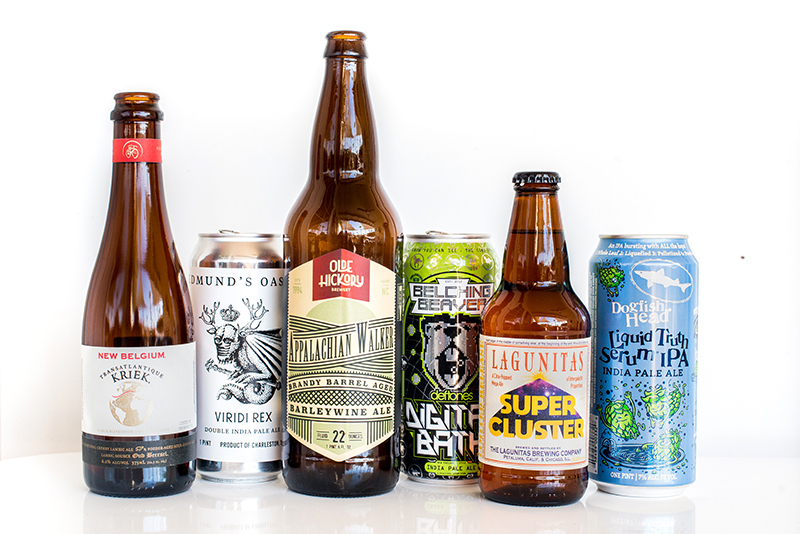 Be it a double IPA or “citra-hopped mega ale,” Lagunitas has another worthy hoppy offering on its hands. From a semi-hazy pour comes an assertive, complex aroma of honey, fresh-cut grass and candied peaches. The first sip yields citrus, namely tangerine and orange peel, as well as a slight “catty” note. There’s just a touch of alcohol on the finish, though given the ABV it’s not unexpected or the least bit off-putting. The beer’s sweet, juicier notes are well balanced with its bitterness, and Viridi Rex finishes semi-dry. An annual release for Olde Hickory Brewery, Appalachian Walker is the brewery’s Irish Walker barleywine aged for more than a year in barrels that once held brandy. That base beer has taken home several awards of its own, but the time spent in the brandy barrels is transformative. There are layers of dark fruit flavors, raisin and fig covered in caramel and, of course, brandy. It is a full-bodied beer, with a touch of alcohol heat. If you’re like me you won’t mind the warmth, as this is a smooth sipper. That said, I wouldn’t begrudge you for stashing a bottle away for a cold winter’s night to see how it develops with a bit of age.